The rain clouds have cleared and the sun has finally decided to shine here in Southern California (you know, that place it never rains) so I took everything off the front porch, gave it a good sweeping and a hosing down, knocked down all the cobwebs and even washed the front windows. Now that it's clean it's time to get it ready for company. 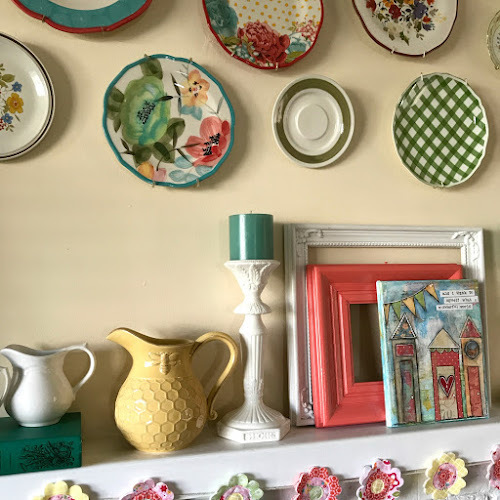 I really wanted to add some splashes of summer color so I have been busy painting furniture, sewing pillows and potting up pretty flowers. I stitched up a pretty banner for the across the windows from scraps of leftover fabric. I used a rotary pinking blade and it made the job super simple. I think it gives the window a festive look. Don't you agree? 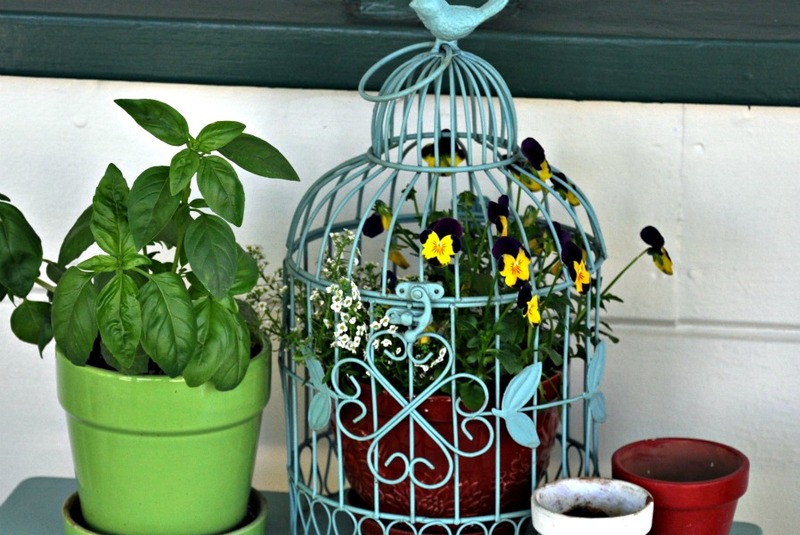 I moved the birdcage to it's intended spot here and added a pot of sweet basil. Since I rearranged the rockers I noticed I have room for a bigger piece of furniture between them. I will have to keep an eye out for an old dresser to paint next time I go to yard sales. I found four of these ball jar glasses while I was thrifting last Friday for $1.00 a piece. 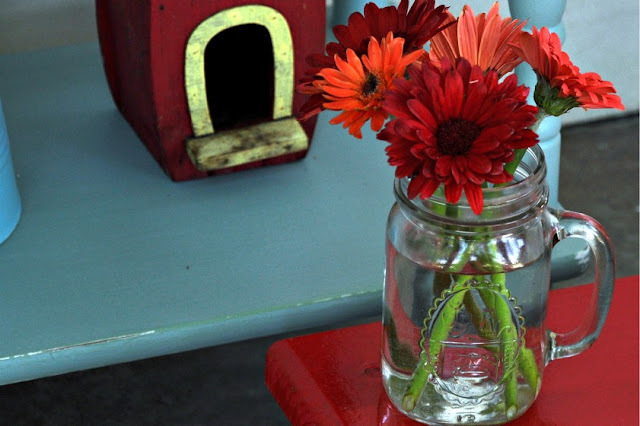 I love the casual feel they give used as a vase on the front porch. I gathered the bird house and watering cans from around the yard and grouped them on the bottom shelf. Now I just need for the weather to cooperate and start acting like West Coast weather should act. What in the world is up with the weather across the country? We actually had hail on Friday! That porch is so inviting! You have the magic touch. I love the paint on the furniture. Your porch looks so adorable Patty! 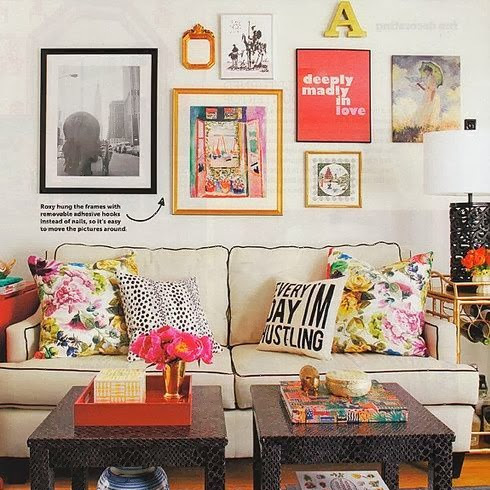 I love thye bright cheery colors and patterns. It will be a few weeks before I feel confident enough to put flowers on the porch or anywhere, but I'm right behind you:>) I can't wait to spruce it up! 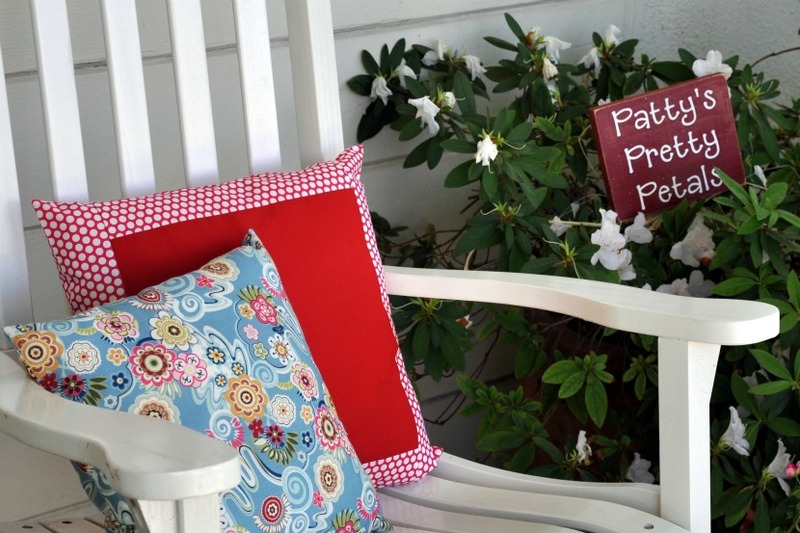 I love the porch, the pillows, the quilt,the furniture...Everything! It's so pretty and colourful...It's a happy place! Wish I had a porch to sit on. We have to sit in our back yard. When we enjoy the front it's the driveway for us. Everything looks so clean and crisp. Waiting for enjoyment. O my, how much do i LOVE your front porch!! So inviting and cozy. A place I would love to visit. We may get six inches ofvsnow tonight in northern Minnesota. Your porch looks great. Love all the color! A beautiful place to be on a pretty day. I L O V E the bright colors on your porch!!! The banner does look festive...Hm~m~m...Memorial Day is quickly approaching!!! Thanks for brighten my Spirits today!!! Weird weather for sure!! I thought it was going to flood, we had so much water. Today is bright and sunny and the mountains look wonderful with the dusting of sun. Your porch looks very welcoming. So very bright and cheerful! I am glad you are getting some rain. I hope it will help when S. Cali. gets those dry spells! 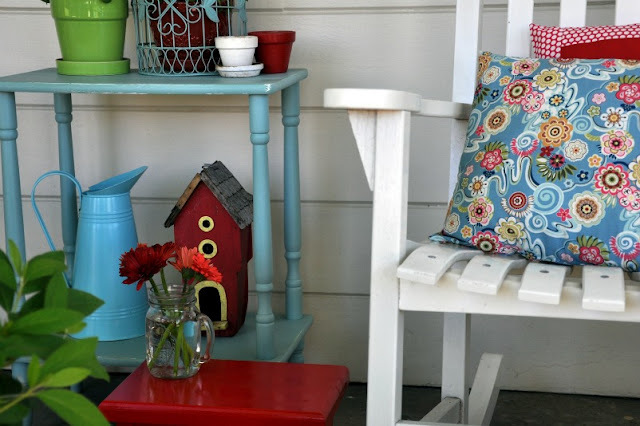 Love the colors, I really want to sit on your front porch, I know I could be oh-so-happy there :) Thanks for sharing the beauty, hoping the weather clears soon for you. That looks so compfy and inviting. I love the colors you chose and the birdcage. Have a fantastic week. Your porch is such a cheery and happy looking place to sit! I love your bright colors for outdoor living. I love porches and yours is lovely. I'll bring the iced tea and sugar cookies. It's gorgeous and oh, so cozy! You did a great job. well, i could certainly sit a spell and drink some tea on that beautfiul porch! LOVE the quilt and pillow!! Very pretty spring porch. Love it. What a lovely place you have. Very nice!! I love the red and aqua together~very inviting! Very pretty! I love the quilt on the rocking chair...hope you can enjoy it soon!! Patty, your porch looks so inviting and relaxing. I would love to have a porch like that. I hope the weather settles down across the country this week. Your front porch is absolutely beautiful, I love all the furniture and nick nacks you have on display. What a perfect place to spend a warm afternoon. Beautiful. I love what you did. Can we hang out on your porch? 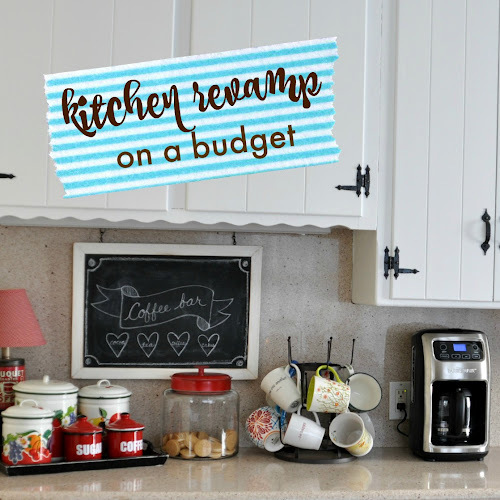 I'll bring lattes! I think I could just breathe sitting and hanging on your porch. Looks like the perfect place to start your day with a cup of coffee! Or end it as well! Thanks for sharing! You did a beautiful job on your porch. Love the little table with all your pretties. Inspires me to spiff mine a little. Thanks for sharing. Today is a day that I could benefit from sitting on such a pretty front porch and getting my thoughts in order. You've created such a welcoming space, Patty. 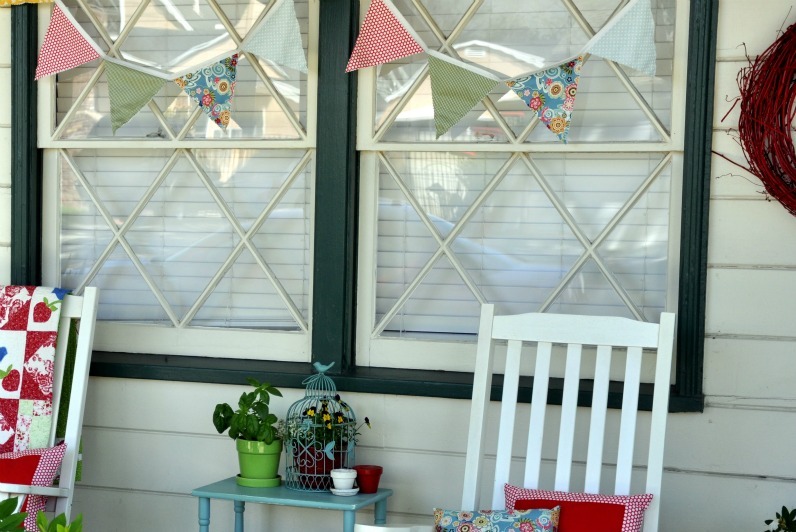 Your porch just Looks like I need to come over and sit a spell...we could chAt about your adorable banner and cute birdcage! Lovely! I would love to be sitting out there this morning with a cup of coffee enjoying the sunshine! We had two days of it and now back to rain. Love the colors you used!! Your front porch is lovely and so inviting. I love all the colors that you have going on. So pretty! 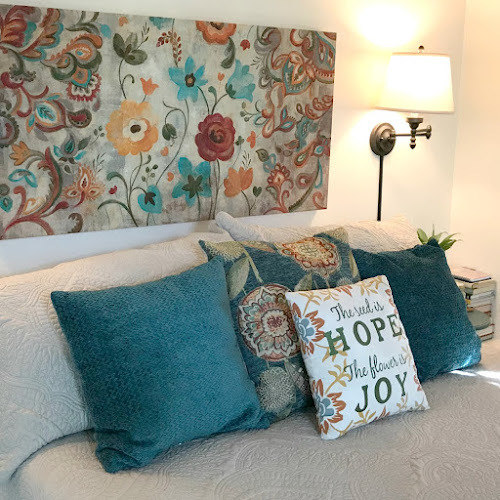 What a great start to welcome guests into your home. It is beautiful and very inviting. Definitely makes me want summer to get here - yesterday! Found you through BNOTP. Have a great day! 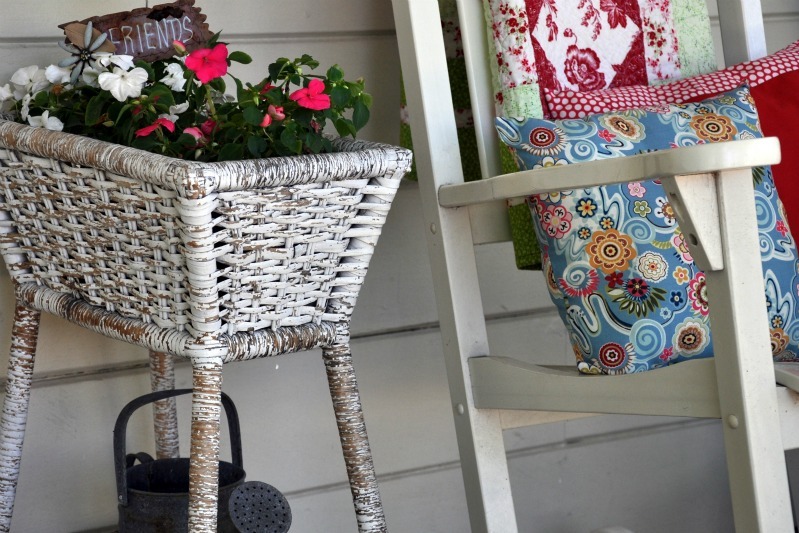 Your porch is charming! I am ready to fill some outdoor pots with some cheerful flowers! I love the colors! This is so sweet, fresh and welcoming! Oh how I LOVE your porch, it is fabulous!!! Love the happy colors that you are using! Just had to smile looking at your pictures! My first visit, but certainly not my last, also your newest follower! 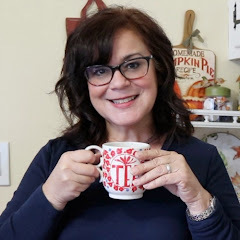 Thanks for stopping by my blog, that is how I found you!!! Your porch is so cheerful and bright. I could cozy up and read a book there. I really like the cheerful colors you have. SO inviting and happy! Oh Patty, it is so pretty! 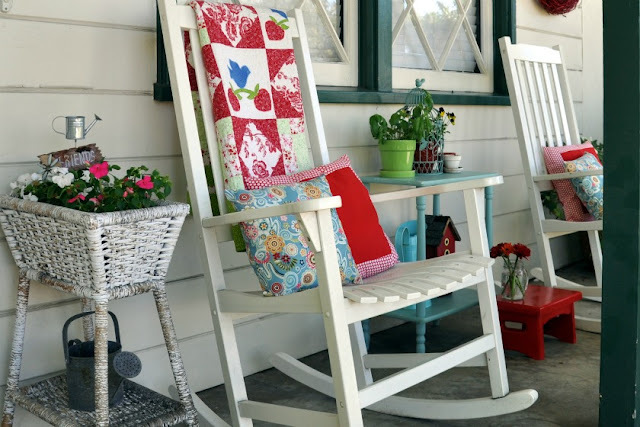 I would love to come visit your charming home again, and this time sip tea on the front porch in those wonderful rockers!!! Such happy colors out there. Think of you daily my friend. Question about your Radio Flyer. Do you know what the number means. Mine has a #9. I think yours was 189 or something like that. Just wondering. Must look into that. Hubby replaced my wheels and he said, I now paid more for my 5.00 wagon than you did. Ha! What a lovely porch! Love the details and your flags are just precious! How bright and cheerful........love it. Im now following you and hope you'll come visit me at http://PickinandPaintin.blogspot.com and maybe you'll decide to follow back. THANKS. 50 comments holy cow. Your porch is perfect Patty. I always love to see what you do with it and you outdid yourself this time. Come do mine. Your porch is gorgeous! So welcoming and cheerful. Hi there - I just stumbled across your lovely blog and just had to tell you how beautiful your porch looks! I have a serious case of the "wanties" having seen your rockers. Love what you have created, it looks the perfect place to relax. Enjoy! I am picturing myself on your lovely porch reading and rocking . . .